I love living in Phoenix, but sometimes you just gotta get away. And at the risk of sounding like a commercial for Arizona, that's why it's so great to live there. Because all you gotta do is get out of town, and the scenery changes very quickly. Yesterday I rode along with a co-adventurer who is typical of the people that I like to ride along with, someone who just needed to get out of town for a few hours. 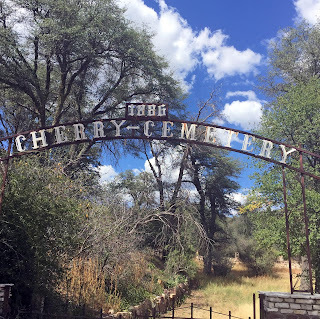 We went to Cherry, Arizona. If you've been to Cherry, you know what I mean. If you haven't, then it's kind of hard to explain, because there's really nothing there. And that's exactly the point. Places like Cherry have always been my antidote for the feeling of stress and strain that I feel living in a big city. Now don't get me wrong, I like living in the big city. I like my little neighborhood in Glendale (a suburb of Phoenix), but every once in a while I want to see something besides 100+ temperatures, and cactus, and traffic lights. 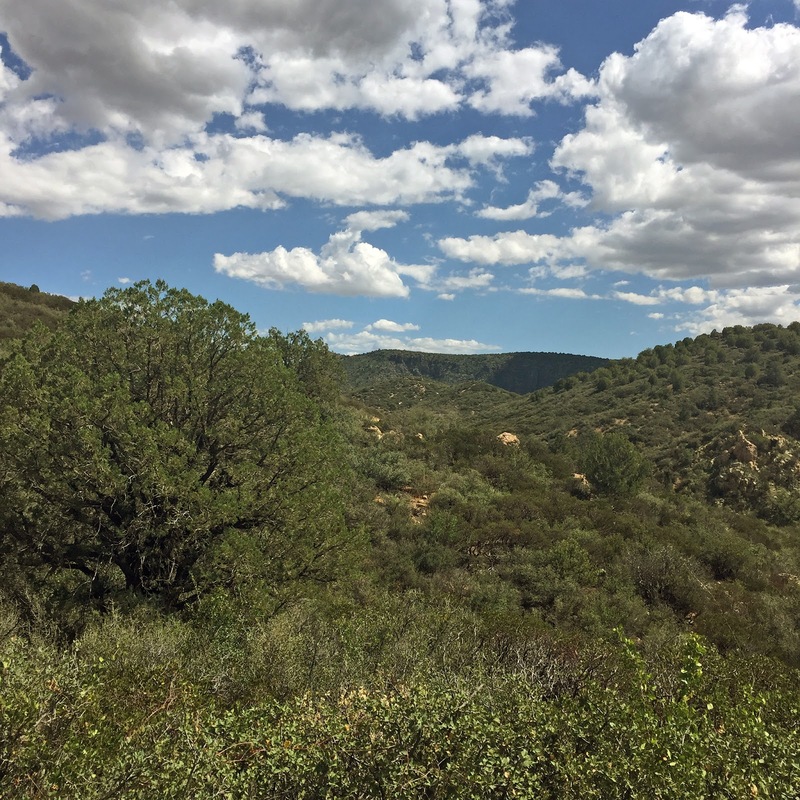 And since the Phoenix metro area is conveniently located at the bottom of many hills, all you gotta do is climb up those hills and you can go from 1,000 feet of elevation to 5,000 feet before you know it. And everything changes so quickly it's as if you're watching a time-lapse. The desert becomes high desert, then the hills start to turn green, and you see pine trees. If you keep climbing, it can get too darned cold for an old desert rat like me, so I'll rarely go all of the way to Flagstaff. Although I've never really had any excuse for it, I've always gotten the "hee-bee-jee-bees" in places like Los Angeles, and Phoenix. I love those places, but I've always felt better getting away for a little while, finding quiet places. 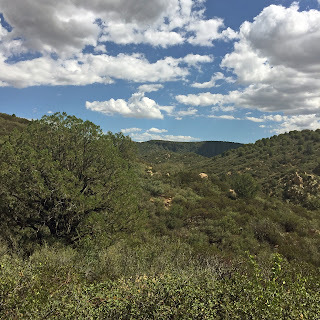 And then when I find these quiet places, like Cherry, Arizona, I think that I wouldn't like to live there, I become concerned about whether I would have good internet access, I look at my phone and there's no coverage. So I roll back down the hill and am reminded of why I really do prefer to live in the big city. Cherry, Arizona is just a scattering of a few houses, including a bed-and-breakfast, along a dirt road. The most interesting place we saw was the cemetery. In the whole time we were there, wandering around a bit in the cemetery, I saw no one, and when we got back in the truck I saw another car and jokingly complained about "the darned traffic". We waved to each other, because that's what you do in places like that. The big city is filled with people who always have eyes front, never acknowledging anyone, except maybe to curse at them under their breath in traffic. I understand, the big city does that to people. I just love going to these places. I just want to stand there, and soak up the peace and quiet. And if anyone asks me why I'm there, I've always just said that I needed to get out of town. Image at the top of this post: the road to Cherry, Arizona.